Personnel – Vinny Golia: reeds and woodwinds; Gavin Templeton: alto sax; Daniel Rosenboom: trumpet, flugelhorn; Alexander Noice: guitar; Miller Wrenn: acoustic and electric bass; Andrew Lessman: drums and percussion. 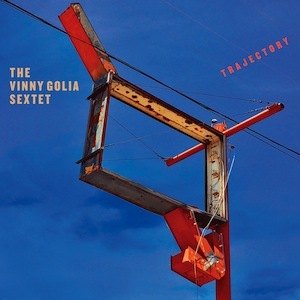 Multi-reedist Vinny Golia, a prolific explorer, freethinker, and innovator, has been a multifaceted bandleader since the 70’s, and his discography is aggrandized with fruitful collaborations with the likes of Wadada Leo Smith, Tim Berne, Alex Cline, Rich Halley, and Nels Cline. His new sextet includes five former students and emergent talents: alto saxophonist Gavin Templeton, trumpeter Daniel Rosenboom, guitarist Alexander Noice, bassist Miller Wrenn, and drummer Andrew Lessman. Trajectory is a riveting double-disc album with enough bite to attract free and avant-garde jazz fans as well as enthusiasts of an audacious crossing between modern creative and groovy funk. This work consists of a careful selection of tunes penned and performed by Golia for over a decade. It was released on his own label, Nine Winds Records, in collaboration with Orenda Records. The band kicks off with “Ts'emekwe”, where obscurity reigns until a cheerful romp, permeated by a lively funk pulse and well-coordinated movements by the horns and guitar, becomes the dominant factor. Wild in-and-out solos spread everywhere, contributing a sheer force and precision fury to the typical avant-garde settings created in compositions like “Dr. Loomis, Welcome Back To The Hospital”, a churning Ornette-style ride featuring crashing unisons and individual stretches, “By The End Of The Day”, with Templeton’s ebullient alto and Golia’s hard-hitting baritone challenging the guitarist in his adroit comping, and “Will, It's A Valuable Appendage”, another straightforward punchy tune with rock vitality and flawless paralleled melodies. Rock and funk delirium is a constant on compositions like “OK Doctor Xavier”, whose brawny muscle and knotty essence are stressed by nervy bass flows and infectious drum fills; “Spaniard's Dilemma”, which boasts a distorted guitar ostinato over a fuzz-inflected groove, double saxophone trills, and inescapably abrasive counterpoint; as well as “Ananaki” and “Sparks Of Dare”, two forms of progressive, often-noisy funk journeys that positively quiver with edgy collective flywheels and exclamatory phrases of opulent tonalities. Other tunes fall into the contemplative section, cases of “Ugly Bags Of Mostly Water”, a chamber jazz dance between baritone and alto saxophones supported by taciturn backing atmospheres; “The Penabus”, an airy restrained swagger propelled by mallets; and “Gift Of The Nile”, a prog rock excursion where spooky flute sounds hover on top of acerbic chords. Golia’s sonically arresting originals gain another dimension when in the hands of this freewheeling sextet, which he commands with tensile strength. Strategically using groove as an aesthetic aid, this is a work of precious, exceptional power.